The olecranon is the part of your elbow that is pointy in the back of your elbow. 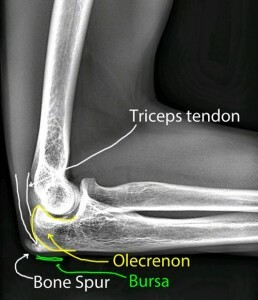 The triceps tendon attaches to the olecranon. What is the olecranon bursa? The olecranon is covered by a thin layer of tissue called a bursa. The bursa allows the olecranon to move under the skin smoothly. When the bursa is inflamed, it can fill with fluid and look like a golf ball is under the skin. How does the olecranon bursa become inflamed and swollen? The bursa can become inflamed from overuse, from irritation of a bone spur, or from an inflammatory condition like an infection or gout. Your medical provider will examine your elbow and make sure it is the olecranon bursa that is inflamed and swollen. There are other conditions that can look like olecranon bursitis like a fracture or triceps tendon rupture. An xray of the elbow will show any bone spurs on the olecranon. An MRI is rarely needed to diagnose olecranon bursitis. If the bursa looks infected, the treatment includes drawing the fluid off of the elbow with a needle to send to the lab to look for bacteria. Antibiotic treatment will be needed if bacteria is found in the bursa. If the bursa is not infected, then the elbow should be compressed with an elbow wrap and the elbow should be kept still to keep the fluid from coming back. If the fluid comes back and the elbow is painful, then the bursa can be removed with surgery. If there is a bone spur causing the bursitis, then the bone spur can be removed as well. How long is the recovery from surgery for olecranon bursitis? You will be able to return to light activity in two weeks and then you can gradually return to normal activity in 6 weeks. The pain from the olecranon bursitis usually goes away after 6-10 weeks.